Computer chips specialized in training neural networks will enter the market in 2019 and they are due to really take off in 2020. Here we want to explain a little bit about processor lingo- the AI boom really started with the transition in traditional computing from CPUs (Central Processing Units, or for those non-technical readers, the large square box desktops used to have back in the day) to Graphic Processing Units of GPUs, which were 40-100 times faster. To add to the slightly confusing mix, Google then went and developed TPUs or Tensor Processing Units, built with the specific purpose of neural network and machine learning projects. These days you can purchase time usage for Google’s Cloud TPUs. Whilst modified, modern GPUs are fast, some even faster than TPUs, the latter have the advantage of being specifically built to perform in the cloud and accelerate machine learning. They enable neural network training happen, broadly speaking, via general computing, through the fitting of different models and most importantly via large matrix multiplications, making your AI smarter, more usable. As machine learning applications become more popular in various industries, TPU usage demand increases. So we believe it’s inevitable for Google to face some competition in the TPU market in 2019, an businesses that use AI in their operations will and should start taking advantage and buying computing time on the cloud at more competitive rates. Data Engineers will be able to build bigger and more complex models without waiting months to see if their modifications have had the desired effect. It will no longer be a question of who is using AI and who is not - in the future, the question will be whose AI is the smartest. Chat windows are popping up onto our screens more often and thankfully chat quality has seen significant improvements. This has changed the general attitude towards live chat - you can actually expect to get a decent service experience, heck you can even expect to get the answers that you need from a chatbot. Currently, chats are either totally run by bots or are a combination of chatbot features and human reps i.e. a bot starts the conversation and human joins only when and if necessary. And when AI comes into the mix, it can really help bots become smarter, and identify users’ needs and act accordingly. But only a fraction of companies, 2% according the Spicework research, are building their own custom AI chatbots with 10% planning to start the process by 2019. So why is the rest still hesitant? The first and most common reason is that they find AI chatbots misunderstand requests (over half of the companies, 59% found this). Companies worry about chatbots executing inaccurate commands, failing to distinguish owners’ tone of voice and understanding accents. These concerns are understandable - after all these bots represent their brands, so communication should be held at the same standard as regular company representatives. The same research studied the reasons why companies haven’t implemented AI chatbots in the first place - half of the respondents said they lack or have a limited amount of use cases. 29% worried about security and privacy issues, 25% about costs, 15% about the AI chatbot accuracy and 14% were concerned about the lack of management support. In 2019 there will be a renewed focus for companies creating their own custom-built chatbots. Predictions state that a whopping 10% more companies will have customised AI chatbots by 2019, and as AI implications become more common, the percentage will keep growing in upcoming years. Spiceworks found that 20% of companies in the research believe they have the skills, talent and resources to implement and support AI in the future. As development accelerates, the aforementioned issues companies have with chatbots will certainly start resolving - so jump on the AI chat train asap and don't leave your business dragging behind. NLG is a form of AI that transforms data into text and spoken narrative and can provide an understandable visualization of the vast amounts of data. Imagine having 1000 Excel sheets of data with seemingly random figures and all of a sudden a program automatically creates three perfectly clear charts out of those with a well crafted five sentence narrative. Data is, more often than not, lengthy, time-consuming and tricky to interpret, which means a lot of it can be wasted. NLG is changing that for various industries, generating overall efficiency improvements, better customer experience and quality content. NLG will help widen the audience for your data and serve as a standard for your competitiveness. Finance & Insurance: NLG produced news reports based on stock market results, customized press releases for local markets based on mortgage demand, compliance reports, etc. E-commerce: Updating category pages and product descriptions. Combining personalization with NLG to understand if someone is shopping for themselves of for someone else to generate the correct messaging. And with Christmas coming up, NLG can help create seasonal promotions effortlessly and put some Christmas spirit into your catalogs. Human Resources: Automating the creation of open job descriptions and their publication to any site necessary. Travel & Tourism: Automate descriptions about locations, hotels, resorts, restaurants, and even events. Smart watches, smart phones, smart cars, smart refrigerators… you name it! Again, for the non-techy reader, edge computing is a network of separate devices thinking independently and in cooperation, instead of separate devices with a centralised brain like the cloud. The independence and cooperation of the edge requires AI - and each type of device needs its own one! This kind of tech includes street lights, homes with cameras or other sensors and air drones. And the more we develop the tech that lives in these items, the more we can expect to get out of them. Computing chips in our phones now allow us to implement smarter apps that don’t even need internet connection to function, allowing genuine real-time usage. The same applies to other products from cars to refrigerators - imagine walking into a store and while you are passing the dairy section you get a note from your fridge on your smart watch reminding you to get milk. This suggestion would be based on your current and prior behavioral data, location data, and data that is connected to your smart devices. And AI? AI is running the show behind the curtains and using all that data to connect the dots and make actions accordingly. 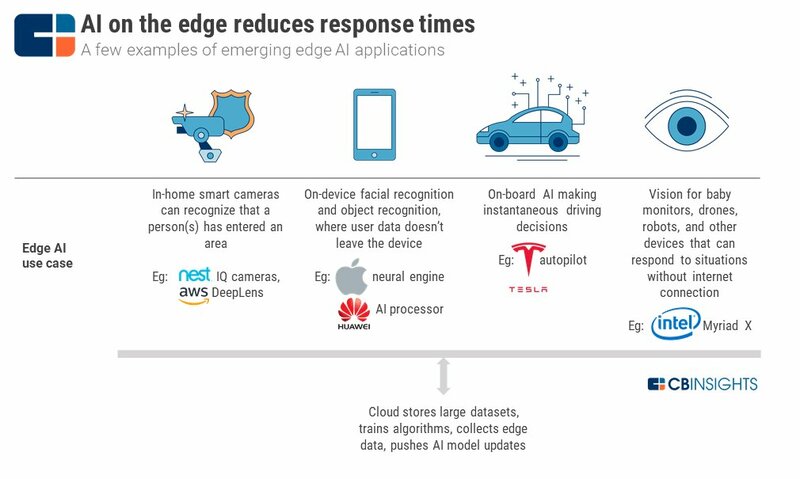 The AI/ edge computing combo could be a great one in the years to come, if you are a device manufacturer or software developer or part of a company’s management team, you should be asking yourself how can we utilize AI on the edge? Getting personalized online assistance when you need it most has seen some serious improvement over recent years, so now imagine skipping the annoying bit of explaining your issue (sometimes to multiple different agents! ), imagine if the agent already knows what our specific problem is and offers help before you've even had a chance to share it? This is bound to be a reality in the near future, especially when it comes to sales. As the amount of data collected increases, sales people get more knowledge on us as customers, and even if we don’t like the idea of being tracked, there’s one clear upside- no more generic sales pitches thrown our way, only what we want to buy, in a way that is appealing to each of us. In the future, sales will be assisted by virtual assistants powered by AI, making consumer targeting much more convenient. Assuming that a consumer has given their prior permission, a salesperson will be able to contact him or her in the right situation with the correct information immediately. We are already getting targeted actions when arriving to a new city or country, and this is heading towards a reality where marketers and salespeople are able to understand why we have come to their webstore and what are our intentions are. There’s not enough data to achieve this as of yet, but the amount of data increases daily, so watch this space. Peter Schwartz from Salesforce wrote how within 10 years assistants like Amazon Echo will be more conveniently available just as today’s smartphones. Salespeople will be able to ask these assistants who they should call or what stocks they should trade today etc. “It will be as if you have someone whispering real-time sales intelligence in your ear.” In the same blog he mentions a more distant future scenario, where a sales rep will be able to engage a customer via VR and create a selling experience in front of their eyes. This idea works with augmented reality as well. Imagine opening your phone in a shopping centre and an on-screen arrow guides you directly to the jeans you want, and they are now on sale. AR and VR will produce endless possibilities for sales. However, like Schwartz stated, full scale, this is years away and sales people don’t need to look for new careers yet. Instead, they should educate themselves to utilise these technologies and take full advantage of virtual assistants available right now. Some of possibilities mentioned in this blog are fully functional already and others will be in sight soon. So in order to stay competitive, it's vital that you prepare yourself and your company for the future AI trends to come! Remember - we must learn to walk before we can run! So what is AI or machine learning in the first place? Let's go to the basics first with our whitepaper!